If you’re looking to deal with frizzy, hard-to-manage hair then this at home treatment in three steps will leave your hair looking smooth and sleek, but with movement at the same time. Kérastase Paris Discipline Smoothing 3 Step Regime aims to tackle the third major hair concern hair ,manageability especially frizz in the summer. 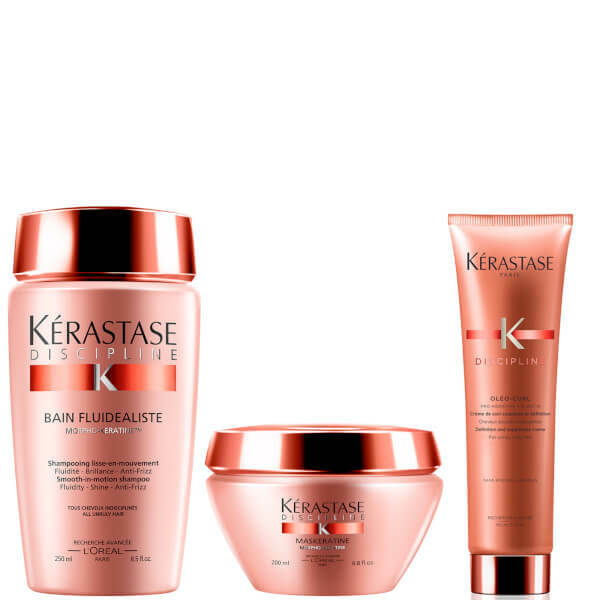 Tame unruly locks with the Kérastase Discipline Smoothing 3 Step Regime; a trio of must-have treatments that work in perfect harmony to deliver long lasting results. Expertly formulated with complex regenerative blends catering specifically for curly, thick and unmanageable hair, the regime leaves tresses feeling fluid and relaxed with a brilliant mirror-like shine. Smooth, strengthen and add resilience to your hair with this regenerative shampoo. It works to gently eliminate impurities, whilst a blend of Amino Acids, Wheat Protein and Ceramide R work to protect hair against frizz and humidity for up to 72 hours. The Pro-Keratin formula creates an even surface area, leaving hair with a soft texture and a frizz-free finish. Treat your hair to some intensive nourishment with this rich hair mask, which provides long-lasting protection against frizz and humidity. Designed to leave hair with increased fluidity and manageability, it boasts a Pro-Keratin formula that works to repair hair from the inside out, creating a smooth surface area for better control when styling. This leave-in formula that works to smoothen, soften and define unruly curls. Utilising a breakthrough blend of Pro-Keratin and Elastin, the lightweight cream increases suppleness and strengthens strands, whilst fighting frizz and controlling hair to leave curls calm and relaxed.